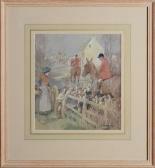 Find artworks, auction results, sale prices and pictures of George Denholm Armour at auctions worldwide. 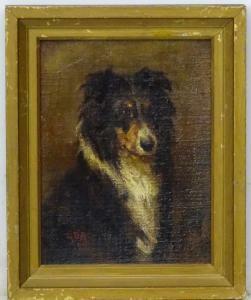 George Denholm Armour (1864-1949), Scottish, Oil on canvas board, Canine School, Portrait of a collie dog, Initialled and dated in red (18)'85' lower left. 9 x 7" Bears pencil inscription ? Verso. And label for 'Alexander Harper' Edinburgh. Some of his paintings are owned by the City of Glasgow, the National Trust, the Aberdeen Art Gallery, the National Galleries of Scotland and the University of Edinburgh. CONDITION: Please Note - we do not make reference to the condition of lots within descriptions. We are however happy to provide additional information regarding the condition of items on request. 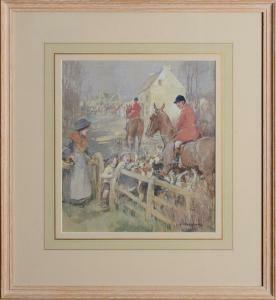 George Denholm Armour (1864-1949) The international match Oil on panel 20.5 x 40.5cm (8 1/8 x 15 7/8 in.) 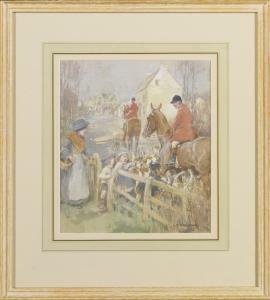 By 1912 Denholm Armour had signed a contract with Country Life to compose three or four drawings of sporting and country subjects each week. 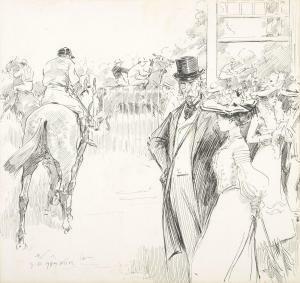 In 1913 he was sent to America on behalf of Country Life to makes sketches of the international polo match. Between 1886 and 1939 there was a total of 12 matches between the British and American teams. In 1913, the Americans nicknamed 'The Big Four' won the match. This oil on panel is likely to be a work made from sketches from this international match. , watercolor and gouache on brown paper, unsigned. 12 x 10 3/4 in. (sight), 21 x 19 in. (frame) and 8 1/2 x 8 1/2 in. (sight), 15 x 15 in. (frame). Together with ENGLISH SCHOOL, 20TH CENTURY, Car Accident with Hunters and Hounds, watercolor, gouache and charcoal on brown paper, sight: 8 3/8 by 8¼ in. 2 works. sight: 12 by 10 1/2 in.